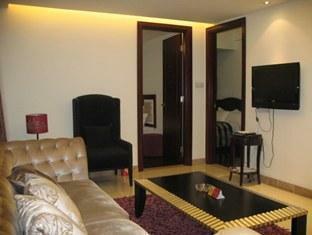 The Grand Continental Service Apartment is perfectly located for both business and leisure guests to Guangzhou. All hotel's guestrooms have all the conveniences expected in a hotel in its class to suit guests' utmost comforts. Each guestroom is fully equipped with internet access, kitchenette, satellite/cable TV. Guests staying at this Guangzhou accommodation can enjoy a wide range of hotel facilities such as laundry service/dry cleaning, meeting facilities, restaurant, business center, car park. For guests to unwind, the hotel offers a variety of facilities and services including gym, sauna, outdoor pool. This hotel is characterized by a combination of modern comfort and traditional element of Guangzhou, making it a distinct accommodation. To make a reservation at the Grand Continental Service Apartment Guangzhou with our secure online booking form, please choose your preffered period of stay.